Dolby reveals first Blu-ray Audio disc with Atmos | What Hi-Fi? Remember Blu-ray Audio? It was the format pitched at audiophiles, which never really took off. Now the Choir of King’s College, Cambridge, is having another crack at it – this time with Dolby Atmos. 1615: Gabrieli in Venice is set to be the first ever Blu-ray Audio disc to use Dolby Atmos. They have chosen 13 pieces of Gabrieli’s posthumously published collections from 1615. There are two discs. The main act is the Pure Audio Blu-ray with 5.1 Dolby TrueHD, 2.0 LPCM 24bit/96kHz, and Dolby Atmos. There is also an SACD hybrid disc, compatible with CD and SACD players. Gabrieli was supposedly the first person to compose in stereo, using using two choirs on the opposing balconies of St Mark’s in Venice. This is an acoustic recording of male voices alongside an ensemble of cornetts, sackbuts (like a trombone) and two organs, recorded inside King’s College Chapel in Cambridge and mastered for stereo, 5.1 and Dolby Atmos. But why? After all, Dolby Atmos was created for banging movie soundtracks full of flying bullets, helicopters (or Godzilla) roaring overhead and raindrops falling on your head. Dolby Atmos for music doesn’t go down that road, but instead aims to replicate the ambience of a live performance. In this case, the aim is to take the ceiling off your living room and turn it into a chapel. The focus for the mix is the precise location of performers, as well as that location’s specific acoustics. For those yet to experience Dolby Atmos, it is a new surround sound technology that adds ceiling or up-firing speakers to the traditional 5.1 system. The aim is to give you a bubble of immersive sound. 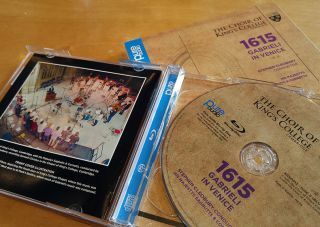 1615: Gabrieli in Venice on Blu-ray will be available from 30th October. MORE: Dolby Atmos: What is it? How can you get it?